A federal jury Wednesday decided that Philadelphia violated the Boy Scouts' First Amendment rights by using the organization's anti-gay policy as a reason to evict them from their city-owned offices near Logan Square. "We can't be kicked out of the building or evicted and we don't have to pay any rent," Scouts' attorney William M. McSwain said after the unanimous verdict by a jury of six women and two men. Scouts lawyers expect U.S. District Judge Ronald Buckwalter to issue a permanent injunction that bars the Scouts' eviction because of their policy - set by the national organization - that homosexuals cannot be scouts or troop leaders. That's not necessarily the end of the dispute, however. The jury's answers to the 11 questions on the verdict sheet were "inconsistent," City Solicitor Shelley Smith said, and when verdict sheets have inconsistent answers, the potential exists that the verdict is flawed. We will be exploring our options." In an unusual address to the jury, Buckwalter said he hopes the Council and the city can reach a final negotiated solution. The Scouts are willing to negotiate and would like to end the nearly seven-year standoff, said Jason Gosselin, the lead attorney for the scouts. "We want to sit down with the city and see if we can resolve this" permanently, Gosselin said. Under the ordinance that leased the land to the Scouts, the city has the right to evict the Scouts without giving any reason at all - just not for an unconstitutional reason, both sides have agreed. Asked if the city would take that step, Smith said "the verdict was just issued today, and we'll be considering all of our options." The jury deliberated for about seven hours over two days and voted unanimously. The jurors ruled in favor of the city on two points: the Scouts right to due process was not violated, and another First Amendment complaint by the scouts had no validity. Jury foreman Merrill Arbogast, 40, a truck driver from Lancaster County, said jurors discussed each of the legal points. "There was a lot of debate before we came to an agreement. . .we took each question and tried to break it down. "On some things we believed the city, on others we believed the Scouts," he said. The trial, which began June 14, was never about whether the Cradle of Liberty Council could discriminate. A landmark 5-4 U.S. Supreme Court decision in 2000 said the Boy Scouts is a "membership organization" and can exclude gay youths and troop leaders. But the City Charter says otherwise, and after years of negotiations the city decided in 2006 that the Cradle Council's refusal to explicitly reject the national scout policy violated the charter. The scouts were ordered to vacate the 80-year-old headquarters they had occupied rent-free, or pay $200,000 a year to lease the building from the Fairmount Park Commission. It is one of two offices operated by the council, which also has Boy Scout troops in Delaware and Montgomery Counties. The scouts contended the city's move is an unconstitutional "coercion" that violates the organization's rights to free speech and equal protection. The city leases land to other institutions that have membership rules, including a Catholic church, and those groups do not face eviction, the scouts argued. The city called that comparison inaccurate, and the jury decided against the Scouts on that point. They did find that the city "would have permitted [the Scouts] to continue to use its headquarters building on a rent-free basis if [the Scouts] repudiated or renounced the policy of the Boy Scouts of America to gays?" They said yes, and added that position was "not reasonable." Those two answers combined were a finding of an "unconstitutional condition." During the trial, retired Cradle of Liberty CEO Bill Dwyer said he and other leaders realized "in our heart of hearts" that "we couldn't repudiate totally the national position. They would put us out of business." The local scouts cannot be forced to "repudiate a policy that the Supreme Court says is protected," Gosselin had said. David Smith, a lawyer for the city, told the jury that the city initially accepted the local group's statement that it opposed discrimination - until learning that the chapter used the national group's employment application, which barred hiring homosexuals, atheists and agnostics. Similar controversies have developed elsewhere in the nation since the high court ruling, prompting a variety of lawsuits with varied results. About 360 school districts and 4,500 schools in 10 states have terminated sponsorship of scout activities because of the scouts' stand on homosexuals, according to the American Civil Liberties Union. A negotiated solution here was reached briefly in 2003, when the scouts agreed not to discriminate against gays, but the Cradle Council rescinded that policy after the national council threatened to revoke its charter. In 2004, the Cradle Council agreed to oppose "any form of unlawful discrimination," but a year later then-City Solicitor Romulo L. Diaz Jr., said that clause was too vague. 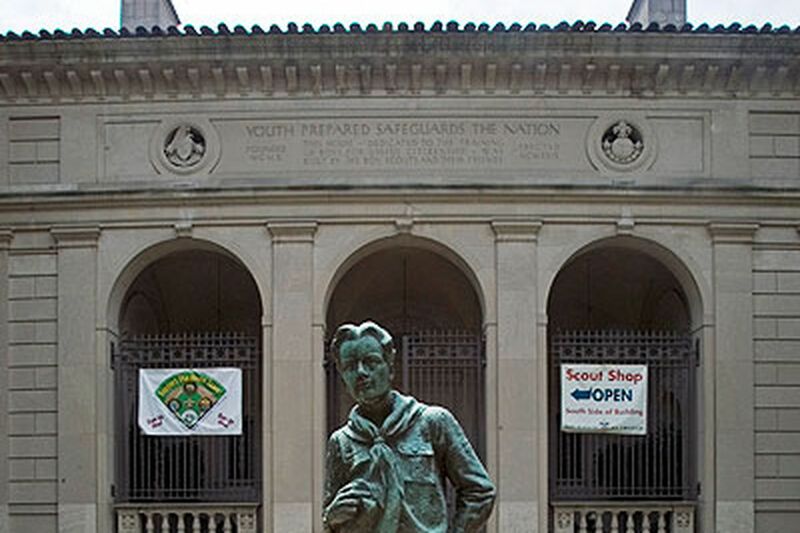 In 2007, City Council voted to evict the scouts. The Scouts can now ask the court to order the city to pay legal fees worth some $860,000.